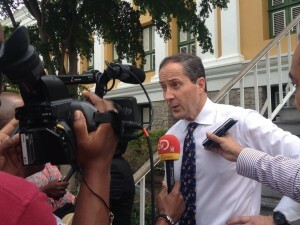 WILLEMSTAD - Geert Jan Knoops believes that the dossier presented by the Public Prosecution during the first day of the court treatment of the case against former Prime Minsiter Gerrit Schotte is not complete. Based on this, the judge can never come to a conviction. He also believes there is a good chance Schotte wins the case at the Supreme Court and that a new trial is coming. He will, therefore, ask today to hold the confiscation case against his clients until after the cassation, if the Public Prosecution is permitted to prosecute.